I'm a pale girl and it's something I try to embrace. But every now and then, I start to long for that kind of golden, sunkissed tan which doesn't come easily to me. Even on those rare sunshiny days in England, I don't tan, I just burn and turn red! If you are lucky enough to tan easily, that's wonderful but unless you live somewhere like California, it's going to be difficult maintaining your glow naturally all year round. Faking it at home with self tan is known for being messy and time consuming but there is now a new breed of self tanning products available that make quick and easy work of transforming from pale and interesting into a bronzed goddess. 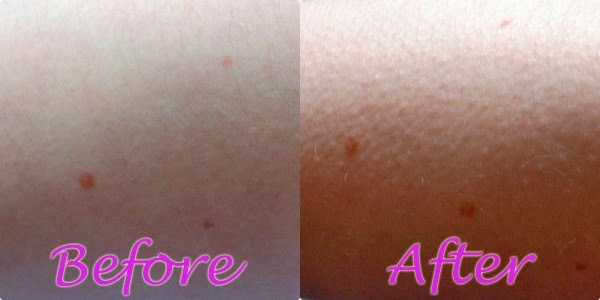 This No More White Bit's Instant Self Tan Mousse in the shade medium has revolutionized how I use fake tan. It's quick, smells lovely and gives a lovely golden glow without that trademark orange tint! Before I use it, I give it a good shake and then dispense a pump full of the light mousse into the palm of my hand before firmly rubbing it into my skin. I would recommend using a tanning mitt and / or plastic gloves because it is an instant tanning mousse and you can end up with orange palms before you know it! It goes on brown which makes it easy to see where you have already applied it and makes getting an even, streak free tan a lot easier. It's also really nice to see some instant results and over the next 24 hours or so, it continues to develop into a deeper and more golden colour. Depending on the colour intensity you are looking for, you could apply this for 3 or 4 days in a row to build up a deeper tan. Personally, I was quite happy with the tan I got after one application but I opted to prolong my tan by using a gradual tanning moisturizer daily after my initial self tan application. I'll probably top up with this product every week when I'm tanning and then continue to use gradual tanning moisturizers between uses. This has a beautiful Lotus Flower fragrance which is very pleasant and quite different from that more typical 'biscuit' scent that a lot of self tans have. The packaging is very user friendly and also super cute! I love the bright colours and it's very quirky but that's no less than I would expect from this brand as No More White Bits is actually part of the Anatomicals brand! Side note: I love the Anatomicals No Old Bags Allowed Eye Gel - see my review here. Interestingly, this product is aimed at both men and women! And although this product gives instant results, it continues to develop into a fuller looking tan during the next few hours after application which can last for around five days. This product wears very well and slowly washes off without leaving that patchy look. I really appreciate how low maintenance this product is as it dries within minutes of applying and then it works it's magic with no additional steps required! It's also has moisturizing properties so you don't need to worry about moisturizing your body beforehand either! 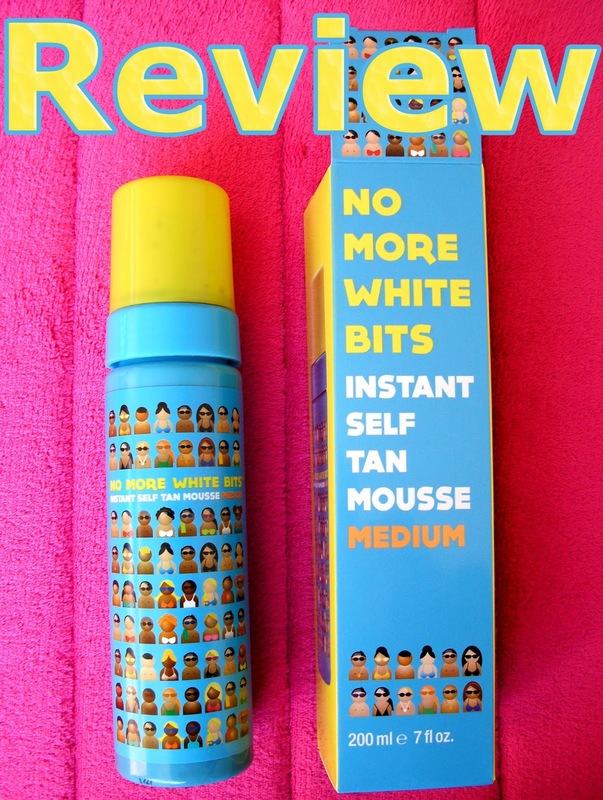 The No More White Bits tanning products are super affordable as they are all priced at under £4 and I'm looking forward to seeing more products from the brand as they launch in the near future. This product is available from several retailers for £3.99 but I've spotted this in Savers for a mere £1.99 which is a total bargain! I may have to stock up for summer! I also have a Shimmer Sparkle Bronzing Gel from the same range so look out for that review soon! Do you tan? And if so, what are your preferred methods / products?